Seaweed could be the secret ingredient to losing weight, research has suggested. 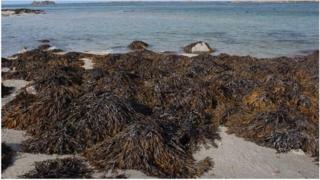 Scientists at Newcastle University said a compound found in common seaweed would stop the body absorbing fat. Tests showed that alginate, found in sea kelp, can suppress the digestion of fat in the gut. The findings, published in the journal Food Chemistry, showed that a four-fold increase in one type of alginate boosted anti-fat absorption by 75%. Although not normally regarded as particularly appetising, the natural fibre found in kelp which stops the body absorbing fat could become more appealing to people trying to lose weight. The scientists said tests on alginate extracted from the seaweed showed it could reduce the amount of fat the body absorbed. They used it in bread during trials and found even a small amount reduced people's fat intake by a third. Now they hope to start full clinical trials. Lead scientist Prof Jeff Pearson, from Newcastle University's Institute for Cell and Molecular Biosciences, said: "We have already added alginate to bread and initial taste tests have been extremely encouraging. "Now the next step is to carry out clinical trials to find out how effective they are when eaten as part of a normal diet." Researchers investigated the ability of alginate to reduce fat break-down by a digestive enzyme, pancreatic lipase. Blocking the action of the enzyme resulted in lower amounts of fat being absorbed by the body. While they said this could help fight obesity, dieticians point out the best way to avoid absorbing too much fat is to cut the amount eaten in the first place.